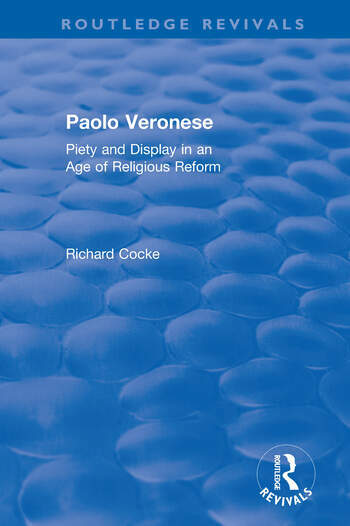 This title was first published in 2001: Paolo Veronese: Piety and Display in an Age of Religious Reform examines the large body of religious paintings with which Veronese (1528 -1588) played a crucial role in shaping Venetian piety. With 117 illustrations (26 in colour) Richard Cocke sets Veronese’s work into context, arguing his mastery of narrative has long been neglected, largely as a result of Sir Joshua Reynolds's criticism in his Discourses. The new expressiveness of Veronese’s work in his final decade is linked with the decrees of the Council of Trent, which resulted in an enhanced display of paintings in Venetian palaces during the 1570s, matched by the renewed decorative schemes in the city’s churches. Contents: Introduction: Early Career in Verona; Venice: the Rooms of the Council of Ten in the Ducal Palace: Daniele Barbaro; Consolidation: the frescoes at the Villa Barbaro, Maser; Consolidation in Venice: San Sebastiano; Recognition and the revival of Venetian tradition; When seeing is believing; The master narrator - the mature secular narratives; The master narrator - the mature religious paintings; Late style: the religious paintings; Piety and display; From Verona to Venice; Venice the heir of Constantinople and new Rome; Change and the Venetian society and Art; Veronese; The Venetian patrons; Veronese’s other patrons; Public Display 1550- 1565; Recognition; Veronese and the tradition of the Venetian alterpiece; Veronese and the tradition of Venetian ceiling painting; San Sebastiano; The ceiling of the Jesuit church of Santa Maria dell’ UmiltÃ ; Venetian Tradition renewed; Veronese and Catholic renewal; Public display 1566-1588: The saint as martyr; The Council of Trent and the cult of saints; The saint as exemplar; Veronese and the tradition of the Venetian altarpiece; Christ’s Baptism and Crucifixion; Lavish Display in existing churches: San Giacomo, Murano; San NicolÃ² at Frari; Santa Maria Maggiore; The new status; Paintings for Private Display; Smaller devotional paintings; Larger narrative paintings; Paintings for camere grandi: the Coccina palace; Old and New Testament subjects for the Bonaldi, Charles Duke of Savoy, Simone Lando and Charles de Croy; Individual canvases; Christ’s Feasts and Last Supper: Feast in the House of Simon, Turin; The Marriage Feast at Cana; Feast in the House of Simon, San Sebastiano and S.Maria dei Servi; Feast in the House of Levi, SS. Giovanni e Paolo; Last Supper, Santa Soffia; Catalogue; Index.